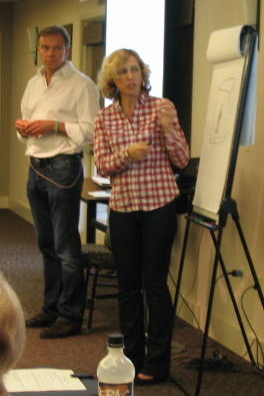 The teachings of Svetlana Smirnova and her ‘right-hand-man’ Alex Teetz, of the SVET Centre in Hamburg, were well received by the 60 people who attended the seminar in Yelm, Washington on October 2 and 3, 2010. Svetlana spoke in German, with Alex translating and co-teaching with her. Her native language is Russian. She learned the methods of Gregori Grabovoi after arriving in Germany and realizing that to work as a Neurologist (qualified in Russia) she would have to essentially repeat her internships in a German hospital. Already clairvoyant, she has studied and worked with Grabovoi’s methods for 12 years now. She also uses the methods of Arcady Petrov. At the Yelm Seminar, a smorgasbord of healing methods were shared. The attendees were most excited about the number codes of Grabovoi. A number code has been identified for nearly every disease. The codes are 7, 8 or 9-digits. There are also codes for each area of the body, which are good to use if you don’t have the exact code for your ailment. The teeth regeneration method of Arcady Petrov was also taught. The various healing methods could be used together or in sequence to achieve the desired results. Each method was explained first, with diagrams and referring to a booklet each attendee received. After the explanation, Svetlana lead the participants through a mental visualization exercise using the process. For us and most people, this guided exercise greatly helped in understanding the process. With so many processes covered over the weekend, even though Devon and I missed a few of the exercises because of our organizer obligations, we felt significant shifts and our heads were buzzy for several days afterward. (Hence, why no update until now! LOL) Devon experienced Svetlana’s energy as a huge field and was grateful to be in her presence all weekend. One energy worker from Sedona said that the seminar gave him the “power tools” to work with the energies he was already using. An intuitive coach from Washington has already started using the methods and says, “I am an Extruder fan!” (the “Extruder” is one of the major regeneration processes.) Another attendee has already reported that the Extruder process helped with a nerve issue. Where did these processes come from? Apparently the processes developed by Grabovoi came about as a result of others wanting to do what he does. Grabovoi is clairvoyant and can affect reality–past, present and future. The methods he developed use symbols and metaphors in a visualization, so others, not clairvoyant, can access those same energies and processes. Even though I am not clairvoyant and don’t even really visualize, I could feel ‘stuff happening’. Will Svetlana return to the USA? Probably! The recent seminar just touched the surface of the technologies she has learned and can share. We hope to host them again soon and assist with spreading the knowledge of such simple processes that can help so many people. Well written Cindi and a true representation of the course. Loved it all. Svetlana and Alex were amazing. Thanks for bringing them to Yelm and giving us the opportunity to experience these advanced beings. It has allowed us to expand our horizons greatly. Svetlana Smirnova and Alex Teetz Regeneration Methods Greatly Appreciated in Yelm | Behold God hit the nail on the head. I am certain to come back here regularly to check out whatever you have to say. You won a reader. click on is the post which brings me to this page. Sorry if this is an inconveniences to you. Thank you, that wasreally interesting. I was born in Moscow in 1974 but my parents fled the country and settled here to the UK. To be honest, I didnt really care much about my russian history until my mum died last month, now I’ve been trying to discover as much as I possibly can. Seemed like cuisine was as good a place as any to start ! You dont generally hear much about russian cooking do you? Anyway, I found a lot of russian recipes here that other readers might be interested in . Thank you Shirley, I will put you on the list and check what’s up with the subscribe button. You would need to contact Alex Teetz. He speaks english. Contact him via http://www.svet-centre.eu . If you do get something organized, Let me know, as people on the East Coast have asked. Also, they are coming here in August to Mt. Shasta, so maybe you can host the the weekend immediately before or after. See the dates on http://beholdgod.com/seminar link. Grabovoi won’t come, Svetlana is his representative. Petrov will only come to teach a class of 30 who want to be TEACHERS, so that will be a while! For that, those 30 have to take his certified Basic course, which hasn’t been taught here yet. do you know where to buy the trilogy of Grabovoi? CAN WE FIND THERE A METHOD TO REGRROW TEETH? Magali, That site is not yet available. I will announce it when it is. Quite a few delays by the production team. Hi, the Triology of Petrov (not Grabovoi) is available on Amazon. I am not sure if teeth are specifically covered in the book. According to the youtube movie about people reading the book, many experienced healing just from reading the book and not practicing anything!